Dr. Formula, formerly known as Bioprosper, and the GreenBean Green Coffee Bean Extract is formulated to aid in weight and fat loss. This supplement also claims to make the user feel younger and more energetic by supporting metabolism. It is made with a blend of all-natural ingredients, including a proprietary blend of nine antioxidant-rich ingredients. 350mg of a proprietary blend of other ingredients. In this proprietary blend is a mix of Garcinia Cambogia, apple cider vinegar, kelp, grapefruit, acai berry concentrate, and African mango concentrate. The capsule is gelatin-based, and also contains cellulose, magnesium stearate, and silica as binding agents. 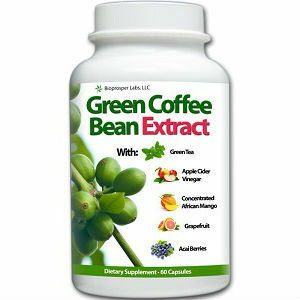 The green coffee bean extract, green tea, and Garcinia Cambogia are all made of 50% extract from the plant. It is unclear if the caffeine listed includes or is separate from the caffeine in the green coffee bean and green tea. The recommended dosage for this supplement is two capsules daily. We could not find any information about whether these should be taken with food or water, but we would recommend taking with a full glass of water. There were no restrictions mentioned on the bottle, so it would be a good idea to consult your healthcare provider before taking this supplement, especially if you have an existing heart condition, are pregnant or breastfeeding, or are sensitive to caffeine. With no available reviews or side effects listed on the company’s website, these side effects are for individual ingredients in the supplement. The presence of caffeine in both the green coffee bean and green tea, as well as an additional 100mg, could cause an increase in heart rate, shakiness, trouble sleeping, and diarrhea. Garcinia Cambogia can cause mild nausea, headaches, and stomach upset. Some of the binding agents in this supplement have also been known to cause digestive issues in those with IBS or sensitive stomachs. Available through the manufacturer’s website, GreenBean Green Coffee Bean Extract is currently available for $8.08, on sale from its regular price of $19.95. It is unclear how long this promotion will continue. When purchased directly through the Dr. Formulas’ website, or through an authorized retailer, there is a 60-day money back guarantee available with this product that entitles you to a full refund, minus shipping costs. While reviews for this specific product could not be found, the store has over 96% positive reviews for other products listed on Amazon, which indicates that the manufacturer stands behind their products and quality. Currently on sale through the company website, this product seems to be priced reasonably for its quality. While a lack of reviews makes the effectiveness unclear, the 60-day guarantee means that the supplement is likely to be effective. Some primary reservations we have include the high level of caffeine that could be disruptive to many users and the gelatin casing which makes this product unsuitable for vegans and vegetarians. Edward Tobias	reviewed Dr. Formulas GreenBean	on December 13th	 and gave it a rating of 3.5.